One of My Crit Partners is Soft (ware) . . . But man is it hard on me! One of my living, breathing CPs introduced me to the marvel of software designed to improve your writing. There are some caveats, I’ll admit. ~ It will never replace the creative, human editor inside you that feels what’s right to write. ~ They never catch everything. ~ Occasionally, they catch the wrong thing. There are several programs out there, and each has its own set of strengths and weaknesses, but overall, they have tightened my writing tremendously. One of the great things about them–most are free for small samples. If you write novels like I do, you’ll quickly become frustrated with the limitations of the free versions, but the main benefit is that you can try it and see if it’s something you’re interested in. My two favorites are AutoCrit and ProWritingAid. You can upload a file or cut and paste into the window, then click analyze on the report of your choice. 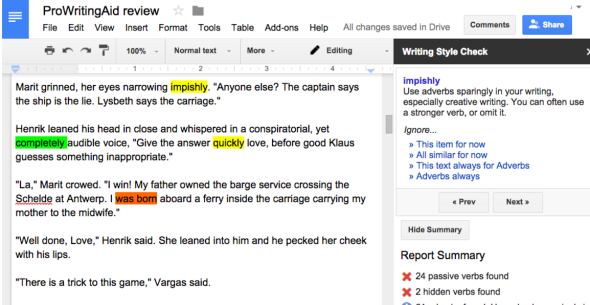 You can run a variety of reports on the uploaded text: pacing an momentum, dialogue, strong writing, word choice, repetition. My favorite sub-categories are overused words, cliches, passive voice, and repetition. There are so many. It’s designed by a writer for writers. Once the analysis is done, you can go into the text and modify it, then immediately re-run the report to see the improvements. I love the immediate satisfaction of improvement. This can be taken too far, though. Another benefit (for those of us who tend to be obsessive–yes my had is raised) is that it gives you an average amount of “acceptable” infractions. No manuscript will be free of some passive voice, an extra “very” or “just”, but this gives a percentage per word count and even gives you a “Good job!” so you can pat yourself on the back. I also feel like it analyzed a bit better than ProWritingAid. I haven’t been using it nearly as long though, so I’m not sure. What I don’t like . . .
You can only use it in an online dashboard. No wifi=no AutoCrit. I like to go on retreats, so this becomes difficult for me when I’m out in the middle of the woods, writing at the beach, or at a monastery at the SCBWI Advanced Writer’s Retreat. I also don’t like the hassle of cutting and pasting back into my manuscript. But that’s really just me whining a bit. Levels of memberships range from $5-$12/month to analyze various lengths of material at a time. The Gold, or lowest membership, allows 1,000 words at a time. The Premium, or highest membership, allows unlimited words as many times as you want. ProWritingAid is an add-on to your word program, so it works inside the file you already have. You select the text inside your file, go to the toolbar always available, and run the report. You can run all the reports together, and this feature is superior to AutoCrit. Seeing all the issues with a sentence saves you from having to fix the same sentence twice for two different mistakes. Your text is always there, ready to be analyzed as soon as you finish a chapter. No need to upload or cut and paste, and the text is always right where you left it. To stop the editor, all you have to do is click a button and it erases all the highlights and marks in the text, leaving what you’ve changed. Viola! It has different colored highlights for the different reports, which is nice. It doesn’t catch everything. I had “you’re” and “your” slip once. A couple other things. The format isn’t as pretty, but whatever. The free version allows 19 writing reports, no interactive editing, online use only, maximum 3,000 words. Premium is $40/year and allows interactive editing, use with MS Word or Google Docs, has no word limit, and includes more reports. Premium + is $45/year and includes all of Premium as well as 50 plagiarism checks per year.